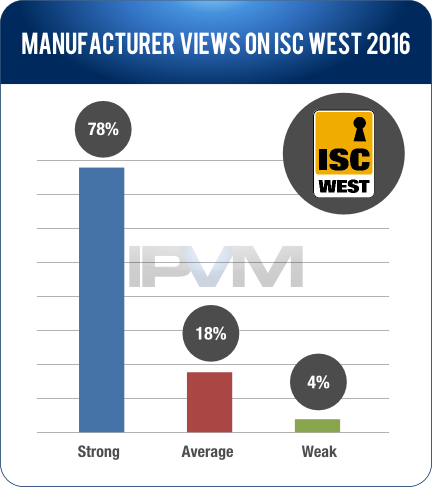 As much as manufacturers were upset with a weak ASIS 2015, they are cheering the results of a strong ISC West 2016. In this note, we share survey results from manufacturers breaking down their satisfaction, with detailed color commentary, concluding with an analysis of the future of ISC West vs ASIS. "Very satisfied. The show seemed well attended this year, even more than last year." "Very satisfied with not only the quantity but quality of visitors to our booth. I can't remember a busier show"
"Very satisfied. High volume of visitors with genuine interest and big potential." "Incredibly. Booth was packed entire time." "Loved it, exceptionally busy with customers and partners throughout the duration." "Lots of activity. Lots of end users." "Extremely satisfied. Traffic for the first 2 days was very strong and we saw many new customers that are considered enterprise level customers visiting our booth." "Lots of attendees across three key categories for us: 1) End-users & prospective end-users 2) Integrators & potential integrators 3) consultants." "I won't be back as an exhibitor. I spent three days demonstrating my new products to Chinese and Japanese manufacturers." While this was clearly not the norm, we also saw many Chinese manufacturers visiting many of the smaller booths, an expensive and counterproductive trend for those receiving them. "Not satisfied at all. Very little traffic in the exhibition area. Smallest lead count ever." "Other than the appearance of a reunion for vendors, it's not clear why vendors continue to participate." "Unsatisfied. Foot traffic was beyond stagnant as far as attendees was concerned." 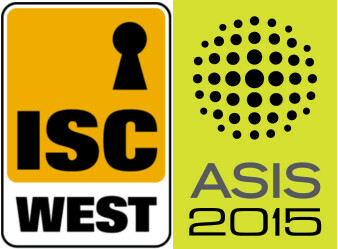 ISC West is now 50%+ bigger than ASIS, both in attendee count and exhibition size. On the attendee side, ASIS reported less than 18,000 total attendees for the 2015 show, while ISC West 2016 claims 28,000 - 30,000. Whatever the exact number is, it is obvious that ISC West has far more attendees. Indeed, the true advantage for ISC West may be obscured because ASIS fills its show with numerous non-exhibitor booths to fill empty spaces (like 6 lounges, poster areas, etc.) while ISC West does not. Moreover, as the many large light blue spaces on the map above show, ASIS is still trying to sell off much of the show floor less than 5 months to the show's start (see ASIS 2016 floor plan). This has become a vicious cycle. 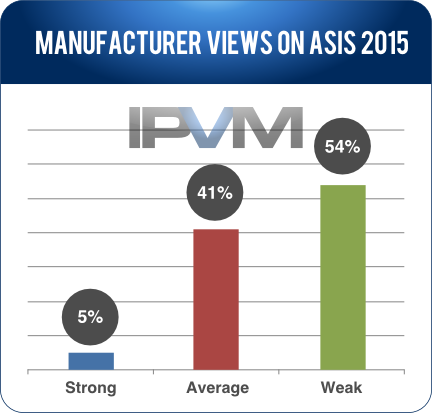 The more the manufacturers are dissatisfied, the less likely they are willing to spend and exhibit at ASIS. This in turn, makes ASIS less attractive to attendees wanting a one stop shop for meeting with vendors. ASIS continues to start their exhibits on Monday, in contrast to ISC West who started exhibits on a Wednesday this year. Monday starts have proven to be bad, as it undermines the first day of the show, which should be the best. Instead, a significant segment of ASIS exhibit attendees fly in on Monday morning, missing out on much of that day. ASIS exhibits this year starts on September 12, just a week after Labor Day and at the tail end of summer. We expect many to find the early time frame unappealing, further depressing attendance. ASIS will need to do something significant to counter this overall downtrend. As is, ISC West is setting up to dominate ASIS, a sharp shift from a decade ago when the shows were widely regarded as equals.